Not only is the Edifier R2000DB 2.0 Lifestyle Bookshelf Bluetooth Studio Speaker stunning, this bookshelf speaker will leave you speechless. An ideal speaker for computers, gaming consoles and mini home theatres! Using newly developed 25mm silk dome Eagle Eye tweeters, this bookshelf speaker makes the slightest sounds clear. Edifier has built in Digital Signal Processing (DSP) and Dynamic Range Control (DRC) to minimise distortion, keeping your listening experience in mind. Connect devices to the R2000DB through optical and RCA input; you can also have more than one device plugged in at a time. Using Bluetooth, you can pair your smartphone and avoid using wires! 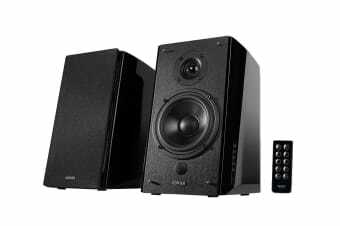 The versatility of the R2000DB bookshelf speakers seek to deliver an authentic listening experience mirrored with Hi-tech wireless functionality. The R2000DB comes with a wireless remote for your convenience. You can also use the side panel on the speaker to adjust bass, treble and master volume. Control your bookshelf speakers and connect to your device in comfort.